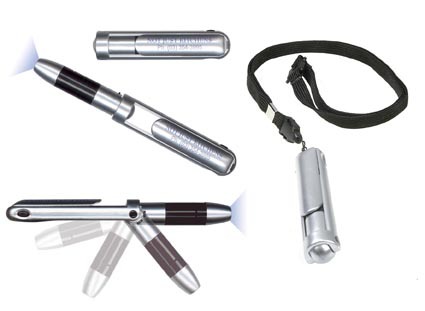 This page has our hardware product range such as cigarette lighters, torches, tape measures which can be printed or branded for great marketing. For a larger range of our keyrings and tags, go back to the promotional home page and click on keyrings, tags and lanyards. Print Area 50 mm x 18mm, please specify horizontal or vertical. Default print is horizontal. Colours available - red, blue, yellow, green, black, white. 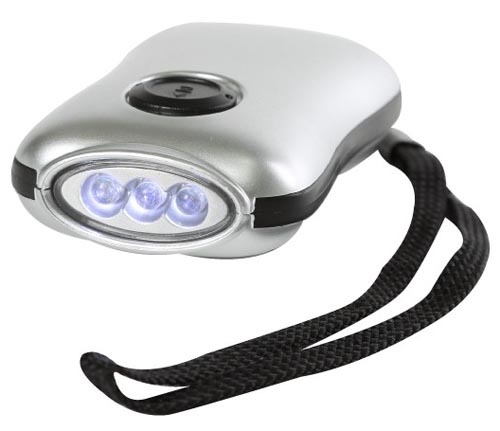 Patented BIC Child Guard system, 3000 lights per lighter. Minimum order quantitity (MOQ) 250 pieces. Packaging: Standard packed in 50 count trays/boxes. This item is classified as a hazardous material. Product ships 7 working days after the proof has been signed as ok to go. Artwork preparation etc can take a number of days on top of this depending on quality of artwork supplied (if any). Circular part - 16 mm circle. Colours: white, yellow, red, green and blue. If you purchase over $300 it is normally freight free to main centres. A funky clip anywhere idea that can be used as a key ring or added to other products. Printing setup $66.50 per colour and/or position. Includes first half hour of artwork. Subsequent extra artwork $75.60 per hour (both excl GST). Repeat prints in the future with no changes are $47.50 per colour/position. Gift box – 110mm x 50mm x 20mm. Print Area: Laser engraving – 24mm circle. Resin – 29mm diameter. Solid metal tape measure key ring with a one metre steel tape. Branding in full colour is available on one side with a resin coated finish or laser engraving. Body – 70mm x 37mm x 2mm. Colour: Silver with Black trim. Colour - White and Black. Print Area 45mm x 40mm. 5 metre plastic tape measure with metal clasp for hooking onto your belt. Colours: Natural, yellow, orange, red, green, blue or black. 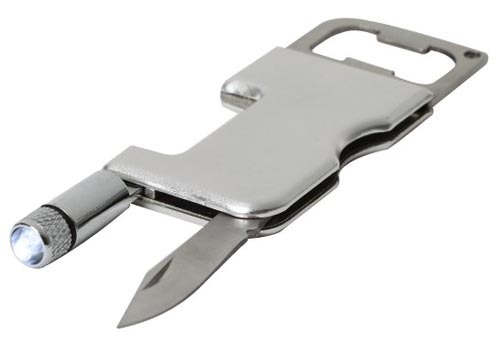 Handy little cutter with safe locking mechanism for blade. Body: 44mm x 44mm x 10m. Dimensions: Body – 42mm x 44mm x 4mm (excludes chain). Ring – 35mm diameter. Print Area: Laser Engraving – 27mm x 22mm or to fit house shape. Resin – 35mm x 32mm. Branded on one side with a full colour resin coated finish or laser engraving. Colours: Shiny Chrome. Colours: White, Yellow, Green, Red, Blue, Black. 1 metre metal tape with metric and imperial graduations. Colours available - Silver or Black. Print Area: 30mm x 30mm. Stylist design - rubber finished dynamo torch to light up any brand. 60mm wide x 35mm high. Can be printed on both sides as long as there are two 14mm x 35 mm unprinted areas. Floats available in white or yellow. Buoy shaped keyring floats with a full set of keys, ideal for boats. Note we can run special colours. Special setup of $200, minimum run 2000 key rings. Dimensions: 70mm x 38mm x 16mm. Colours: Anodised Silver or Anodised Blue. Dimensions: Knife – 93mm x 25mm x 17mm. Box – 112mm x 45mm x 16mm. Print Area: 38mm x 14mm or 60mm x 7mm. 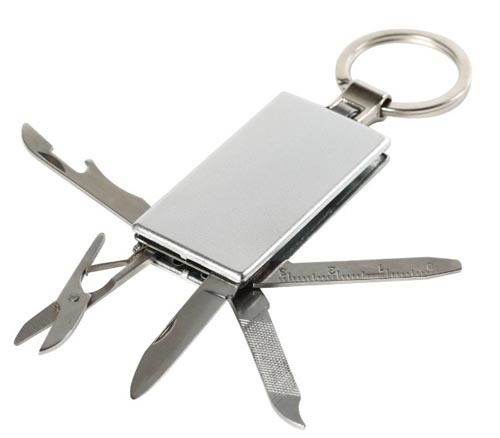 Good quality multi function pocket knife. Product Size: 32mm x 95mm. Print Area: 45mm x 20mm. Scissors, nail file, bottle opener, knife. Just a few reasons to own this winner or gift it as a great promo product. Product Size: 75mm x 35mm. Print Size: 13mm x 40mm. The handy boys toy, that can easily become a keyring. Bottle opener, light, knife. Product Size (closed): 155mm x 100mm. Print Area: 100mm x 60mm. 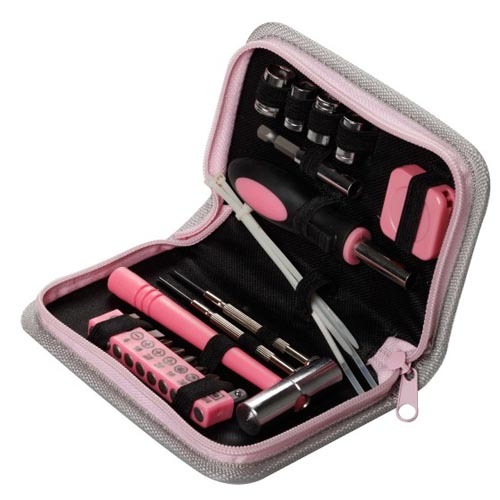 Be ready for anything with this handy ladies tool kit. Even includes a couple of jewellers screw drivers handy for fixing eyeglasses and electronics. great fort the office too. Dimensions: 210mm x 95mm x 20mm. Ice scraper with a serrated edge for removing built up ice and snow. Colour: Silver with Black trim and Black carry case. Fully adjustable 8 x 21 binoculars with tough rubber accents. 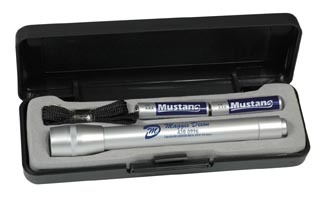 Great for a promotional product of distinction that can be printed. Complete with their own compact carry case with a belt loop, wrist strap and cleaning cloth.